New stompbox boasts modulation delay, space reverb and "destructive" fuzz. 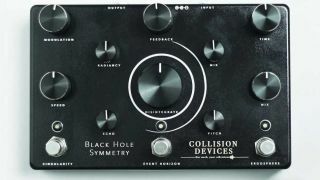 Collision Devices has announced the Black Hole Symmetry, a three-in-one delay/reverb/fuzz pedal. Each effect in the Black Hole Symmetry is controlled by its own range of knobs and footswitches, and can be activated either separately or in conjunction with one another. The Singularity footswitch on the left side of the pedal is the unit’s "destructive" fuzz, which is adjusted by a “Disintegrate” volume knob. The center-placed Event Horizon footswitch is the pedal’s space reverb, with controls for mix, echo, “Radiancy” and pitch. On the right is the Ergosphere modulation delay, with controls for mix, time, feedback and modulation. For more information, head over to Collisiongears.com.